Ji Sin Sim Si, “Venerable Master Highest Kindness”, one of the famous “Five Elders of Siulam” and the patriarch of the southern Siulam gungfu, belongs amongst the most famous characters of southern Chinese gungfu legends. Should we accept the most popular of the above mentioned legends, he was the abbot of the Fukgin Siulam monastery. He taught the vast majority of all future heroes of Gwongdung province, most prominent of whom were the so-called “Ten Best Siulam Apprentices” (Siulam Sap Daai Tou Ji) including also Hung Heigun, the “founder” of Hung Kyun. After the destruction of the southern Siulam, he fled to Gwongdung disguised as a beggar, seeking students to pass on his knowledge and to help him overthrow the Ching dynasty and restore the Ming dynasty using Siulam gungfu. According to Jyu Yujai, he found refuge in the Gwongjau Hoi Tong Monastery where he started teaching Luk Achoi. Hung Kyun is not the only style deriving its origins from Ji Sin. So do other styles, e.g. one of the Wing Cheun branches. Ji Sin reportedly spent some time hiding on board the “Red Junks” (Hung Syun) of one of the traveling troupes of the Chinese opera, working as a cook. 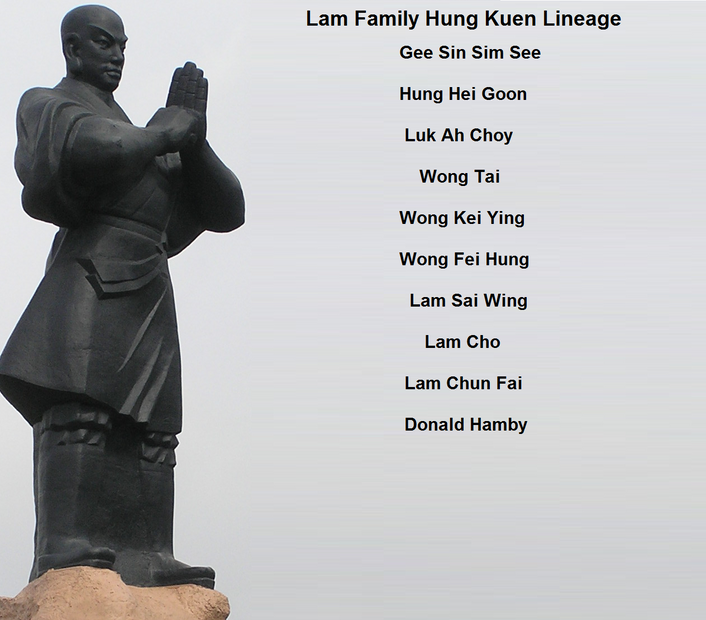 It was Ji Sin who taught the actors the famous “Six and Half Point Long Pole” (Luk Dim Bun Gwan). According to the story, members of the troupe initially did not want to have anything to do with a beggar and told him to go away. Standing on a pier, Ji Sin laid his one foot on the deck of the junk. The actors wanted to set sail but could not move the boat. They then realized they were facing a true master and asked him to teach them. Another story tells about Ji Sin’s victory over a local brawler nicknamed “Old Tiger” Wong. 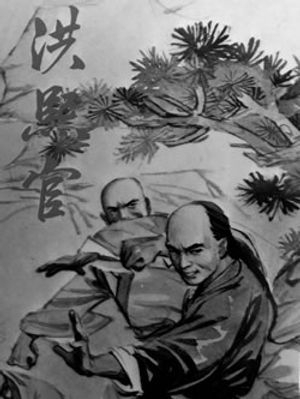 The Venerable Ji Sin started teaching the actors gungfu. They later named it “The Eternal Spring style” (Wing Cheun Kyun) to honor “The Hall of Eternal Spring” (Wing Cheun Tong). Today, that style is called Siulam Wing Cheun Kyun or Ji Sin Wing Cheun Kyun. Most stories agree that Ji Sin died in a duel with taoist Baak Mei, another of the “Five Elders of Siulam”, who betrayed Southern Siulamm Monastery to the Ching government. Ji Sin’s art of the “Iron Head” proved insufficient against Baak Mei’s esoteric martial heigung of “Cotton Belly”. In response to his death, Ji Sin’s pupils started a hunt for the treacherous Baak Mei to avenge their teacher’s death. The “Tea Merchant” Jyu (Jyu “Gu cha”) a.k.a. Hung Heigun was born in the Fa district of Gwongdung province making his living in Fukgin trading – as his nickname implies – in tea. According to legend, Jyu was a distant relative of the Ming imperial house; among his ancestors is said to have been the 15th son of the last Ming emperor, prince Leung, originally named Jyu Manjung. After a quarrel with the Ching nobility, he went into hiding and finally found refuge in the Fukgin Siulam monastery, where he was admitted as a lay apprentice. He started studying gungfu; thanks to his talent and diligence, he soon became one of the personal pupils of Ji Sin himself. The abbot especially taught the young man the hard and ferocious techniques of tiger claws. Soon, Jyu became one of the best fighters of the monastery, who were known as the “Ten Best Siulam Apprentices”. After the southern Siulam was razed to the ground, the survivors dispersed all over southern China. Neither oral nor written tradition implies that Jyu and his master Ji Sin ever met again. Jyu was taking part in illegal anti-Ching activities, hiding on the “Red Junks” and secretly teaching martial arts in the monastery of the “Great Buddha” (Daai Fat Ji) in Gwongdung. To avoid Ching pursuers, he changed his name to Hung Heigun. The traditional interpretation is that by this name he meant to honor the memory of the founding first emperor of the Ming dynasty, Hung Mou (1368-1399). Later in his life, Hung met a lady by the name of Fong Wingcheun. The legends strongly disagree when it comes to details about Fong Wingcheun – according to some sources, she supposedly was a niece of Fong Saiyuk, Hung’s Siulam fellow student. Other versions state that she wasn’t actually a young girl, but Buddhist nun called “Third Lady of Wing Cheun”. it is important to note a similar story about a White Crane system’s founder Fong Chatleung. It is hard to say whether the legends over the course of time merged several people into one or split one person into many. In a book on the “Tiger and Crane Double Form” (Fu Hok Seung Ying) written under Lam Saiwing’s supervision by his pupils, the following well-known story is told: Fong’s father had been maliciouslymurdered by a man called Wu Daai Lik. Fong swore vengeance, sought solitude and became a nun to be able to fully concentrate on studying martial arts. Her technique was good but she was a weak woman. Therefore, she tried to learn new, more effective techniques. One day, a crane appeared, pecking at drying rice. Fong took a stick and wanted to chase the bird away. But the crane was not afraid of her, defended itself with wings and attacked with sharp beak on its long neck. This surprised Fong – despite being armed, she could not hit the seemingly weak and defenseless crane. She started studying the crane’s movements and later developed her own fighting style – the crane style. Hung, who had beaten dozens of the best fighters with his hard fists and aggressive tiger claws style before, was not able to defeat the weak lady with her soft and elegant style. Fong offered to teach Hung her crane style in exchange for helping her to avenge her father’s death. 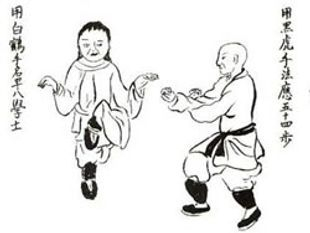 Thus, the core part of the famous “Tiger and Crane Double Form” (Fu Hok Seung Ying Kyun) was formed. Many versions of the story agree that, in the end, Fong became Hung’s wife. At that time, the Siulam monastery was hated by the authorities and any connection to it meant great danger. Hung could not openly teach a Siulam kyun or “Siulam Martial Arts”. Therefore, he named his style Hung Kyun, “Hung’s Martial System” to camouflage its Siulam origin. The name of the style thus not only reflects the surname of its “founder” but also the memory of the above named first Ming emperor, Hung Mou. Concerning the principles, techniques and training methods, Hung Kyun is a descendant of the martial arts of southern Siulam. That is why nowadays – when there is no threat from the Ching (if we accept the above mentioned famous legend about the origin of the name) – the term Siulam Hung Kyun or Siulam Hung family style is often used. When it comes to Hung’s death, the legends – again – disagree. According to one version, he died (similarly to many others trying to avenge Ji Sin’s death, e.g. Hung’s classmate Fong Sai Yuk) fighting the Taoist Baak Mei. Another popular story mentions an unknown girl who reportedly killed the aged Hung with a single “Phoenix Eye” blow and avenged the death of her father, killed once by Hung in a duel. The overwhelming majority of contemporary Hung Kyun masters’ genealogies goes back to Hung’s sidai, a “younger gungfu brother”/fellow student in Fukgin Siulam, Luk A Choi, whose influence on spreading and promoting the Hung family style was the greatest. A Manchu, Luk A Choi was an orphan since youth, brought up by his uncle whose household he fled to escape his overly strict ways. While watching a Chinese opera performance, he met a monk (reportedly coming from the Siulam monastery, by the name of Lei Baak Fu) and started learning martial arts from him. After studying for seven years, the monk recommended him to the Fukgin Siulam, where he learned from the venerable Ji Sin. Nevertheless, Jyu Yu Jai writes that Luk A Choi was admitted as an apprentice by Ji Sin in the Hoi Tong Monastery in Gwongjau, where the abbot was hiding after the destruction of southern Siulam. He taught the talented Luk A Choi everything he knew, among other things also the famous “Taming the Tiger in Gung Pattern” (Gung Ji Fuk Fu Kyun) set, fundamental for today’s Hung Kyun. When Luk learned that his sihing, or “older gungfu brother”/ fellow student, Hung Hei Gun, had opened a school of martial arts, he decided to broaden his knowledge and to continue his studies under Hung’s guidance. Based upon Hung’s recommendation, he finally opened his own school in Gwongjau and became one of the front promoters of the Hung family style. Some sources state that Luk, being known as “Fa Kyun” Luk A Choi for his masterful Fa Kyun set (fa means “flower”), soon left the martial arts circles and society in general and devoted himself fully to medical studies. He died when he was 68 years old.